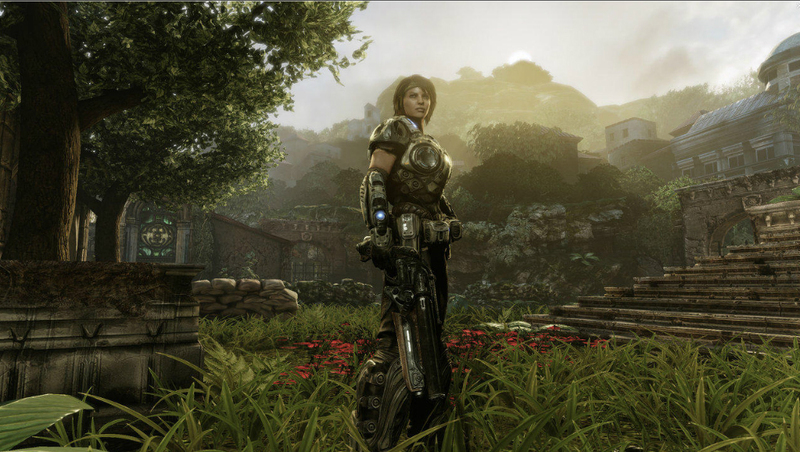 Third title in Epics cover shooter Gears of war sold over 3 million copies during the first week at release and has over the years grown into a legendary title in it’s genre. It holds a lot of the characteristics of a classic shooter game and has despite of criticism of “dude bro” masculinity and excessive violence quite a large audience of female gamers. Chris Wells, Senior Character Artist at Epics art team has over 16 years of experience as an animator for game development and played an important part in the process developing the characters for Gears of War. It might be hard for an outsider to imagine the creative process of an entertainment product of this scale; the technical skills and massive team work where with the level of detail a game character holds today. Chris, if you were to describe for a kid, a five-year old what it is that you do all day. What would you say? -If I were to describe what I do to a child, I’d say that I make puppets on the computer. In simple terms, that’s really all that I do. It takes a team of artists and animators to bring them to life. A skilled 3D artist of today has the opportunity of designing concepts, environments and people that don’t exist in real life. At a technical level where cloth, textures and physique looks fairly realistic that is an extremely powerful tool, even outside of a game context. In game production there’s very little room for mistakes, going back to the drawing table would mean throwing away huge amounts of work. To look into the actual visual possibilities is like a “God’s particle” discovery. Although the technological evolution in the game industry has not as it may seem made the process quicker and easier, it has actually raised the bar for the developers at a time when gamers get used to more detailed and advanced graphic experiences. 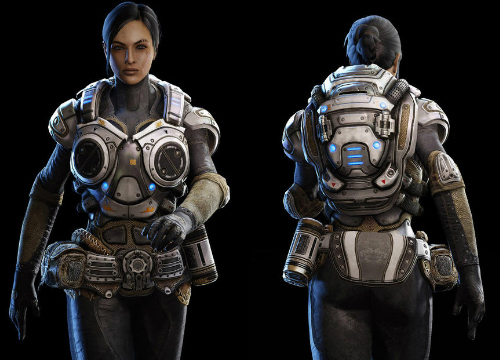 Gears of war has been criticized for the lack of female characters och decided in it’s third entry to introduce playable female characters. The result is amazonian in comparison to a more sexualized definition of femininity. When you decided to female characters into the third title, what was your starting point? Did you just transfer the attributes from the male characters or did they have other characteristics? – As with all game projects, it really is a team effort. The idea started with Cliff as I recall. As he and other developers traveled to comic con and other events, they (myself included) were surprised to find that in addition to male cosplayers in COG costumes, there were several female cosplayers doing the same thing. – So once design brought the mandate down for female COGs, it went from the Art director (Chris Perna), to the concept artist (James Hawkins), to me. We wanted to make sure the women were heroic, like Ellen Ripley of the Aliens movies. For me, it took some time to get the look right, and I would find myself continuously revising and polishing the female models even a year after they were technically complete. -Some of the hurdles were technical, because hair in UE3 at the time was best if it was dark. Anya is a blonde of course, so that required a lot of attention to detail, as well as coding support for new tools specifically for hair. Aesthetically, Chris Perna had a clear vision of what he wanted, but gave me a lot of room to explore and add to the look. The guys were really strong, armored and heavy, so we needed to keep the females to be believable as well. I figured that we could sell it if we had ‘pockets of femininity’, for lack of a better term. 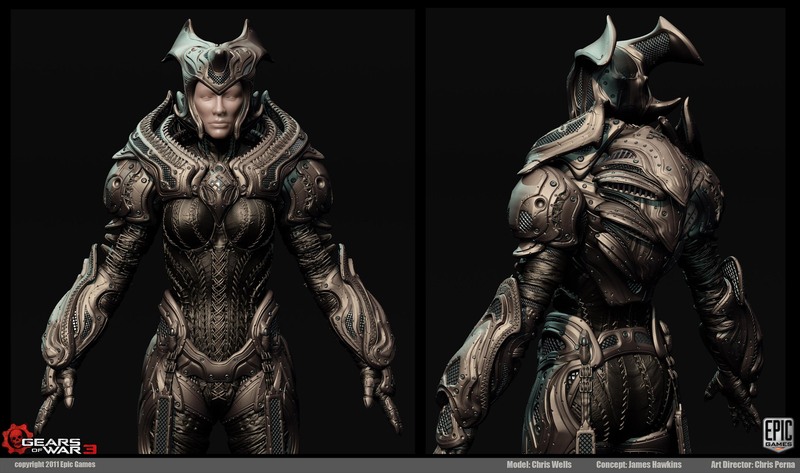 Basically alternating the bulky, hard surface forms of the armor, with a graceful curve in the waist area and the hips. I also tried to make their faces as attractive (yet still strong) as possible, and I used inspiration from fashion models athletes, and even the final fantasy series for cues. In addition, Maury Mountain and Mike Buck did amazing work texturing the bodies of Sam, Anya, and the Queen. I’m really proud of what we accomplished as a team, and thanks to all the fans who enjoy the series!